Get all the latest news and notes from the Charles Schwab Cup Championship. 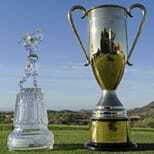 SCOTTSDALE, Ariz. - Bernhard Langer’s approach to golf is meticulous. He is known for his attention to detail and the comprehensive nature of his preparations. It should come as no surprise that Langer applies the same tenets to his health and fitness. He believes in a healthy lifestyle and practices it every day which explains why a man who celebrated his 57th birthday in August continues to enjoy success on the golf course which borders age-defying. Over the years, Langer has talked about his fitness level and how it impacts his golf. In a lengthy interview at last year’s Encompass Championship, he said there is no secret – just the implementation of a common-sense attitude that follows conventional medical advice. And, yes, genetics is a component. “People ask me how do you stay so slim?” Langer said. “I say I eat a lot, and they look at me like I'm being funny. In a way, yes, but in another way I think that it's part of it. When Langer says his “secret” is to eat every three hours, he isn’t kidding. Langer’s on-course treats are basic – fruit (bananas), nuts, perhaps a high-protein sandwich. Of course, Langer has the advantage of a regular and rigorous workout routine. He gets plenty of exercise walking golf courses. Langer, like so many of the Champions Tour players, is a regular visitor to the fitness van. He calls it a luxury that has extended the career of many golfers. “The fitness trailers are really phenomenal,” Langer said. “I think it's a great facility that we have out here on tour. In my case very necessary and I'm not sure I would still be here if it hadn't been for the fitness centers.